A White Martian from M’gann’s past shows up to bring her to justice for her war crimes, putting J’onn and the rest of the team in harm’s way when the DEO must go into lockdown — not knowing which of them is the enemy in disguise. 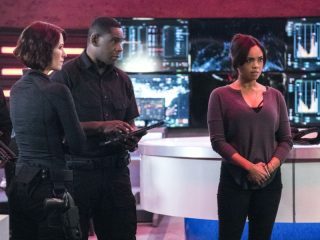 Armek (guest star Terrell Tilford), a White Martian, descends on National City intent on taking M'gann (guest star Sharon Leal) back to Mars to face her punishment as a traitor. Hank (David Harewood) and Supergirl (Melissa Benoist) determine the best way to keep M'gann safe is to bring her to the DEO. However, when it is revealed that Armek shape-shifted into M'gann and is now loose in the building, the team realize he could be disguised as any one of them.